Who wants Chocolate Peanut Butter Caramel Ice Cream Cups? Chocolate + Peanut Butter = a winning combination but Chocolate + Peanut Butter + Caramel = unbeatable. If you deserve a treat (and I think you do!) 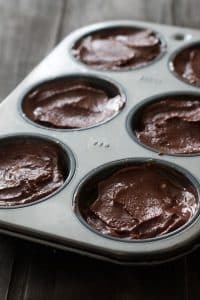 then I suggest whipping up a batch of this simple 4 ingredient Chocolate Peanut Butter nice cream and making these cute little ice cream cups. Individually sized treats and desserts are perfect if you are like me and a bit challenges with “serving size” recommendations. Nice cream or “Ice Cream” made with frozen bananas is such a great way to have a lower calorie treat while still feeling the satisfaction of a full fat, full calorie ice cream. Depending on what you choose to add to the bananas sometimes the bananas can be a little wee bit overpowering. To counteract, I highly recommend adding maple syrup or vanilla extract to your nice cream mixtures. 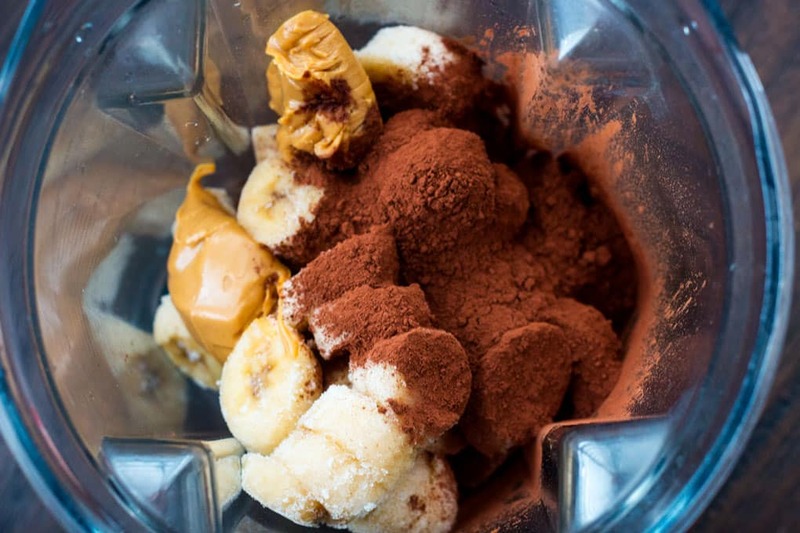 To make this creamy chocolate peanut butter version you need: frozen bananas, peanut butter (surprise! ), maple syrup and dutch cocoa powder. Add to your blender or food processor and process until smooth. 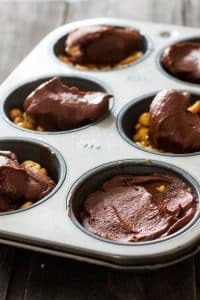 You can stop here and eat it from the blender jar or move to the next step and make chocolate peanut butter caramel ice cream cups. No judging here if you are literally eating this yummy chocolatey peanut butter heaven with a spoon right…this…second. So, I love making individual desserts in my muffin tin. They are just so cute and the perfect size to enjoy at any time. 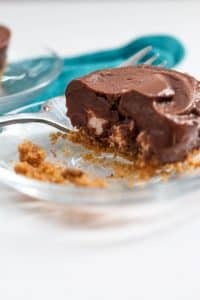 Recently I made ‘Smores Muffin Tin Ice Cream Cakes. A huge hit in my house. To make today’s recipe grab your muffin tin, roll up your sleeves and get ready to work. Just kidding. You do need your muffin tin but I promise you won’t even break a sweat. Add a heaping tablespoon of your ice cream to each of the 6 muffin tin compartment. Pat it down with a spoon. Now you can put your muffin tin in the freezer for 30 minutes or so to firm up or go directly to the next step. Mix peanuts and caramel sauce. 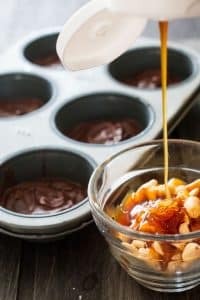 I like there to be lots of peanuts with a nice coating of caramel but you can add more caramel and less peanuts depending on your preferences. Add a layer of caramel/peanuts on top of the ice cream and follow with a second layer of ice cream. Place in the freezer and then you can enjoy them one by one or all at once. 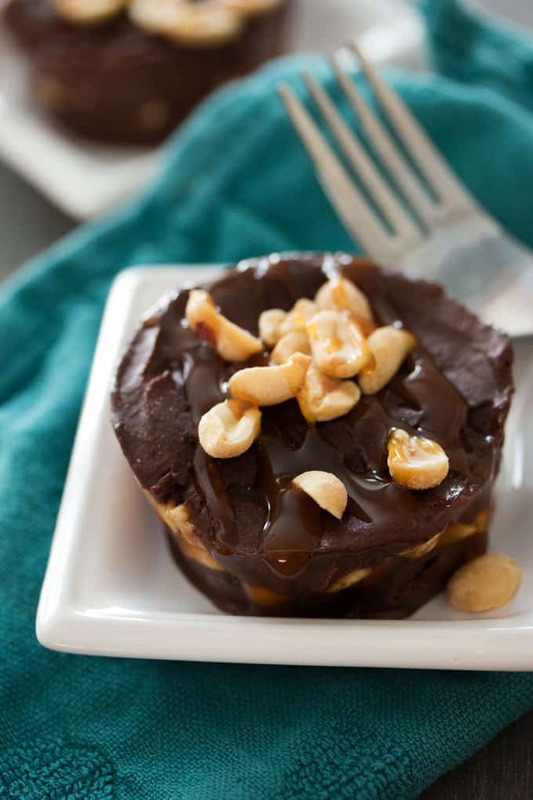 They pop out nice and easy and you can serve with additional caramel sauce and peanuts on top. This is also an easy recipe to make in bulk. You could easily scale this to make 12 or 24 and feed a small army or enjoy them for weeks on your own. 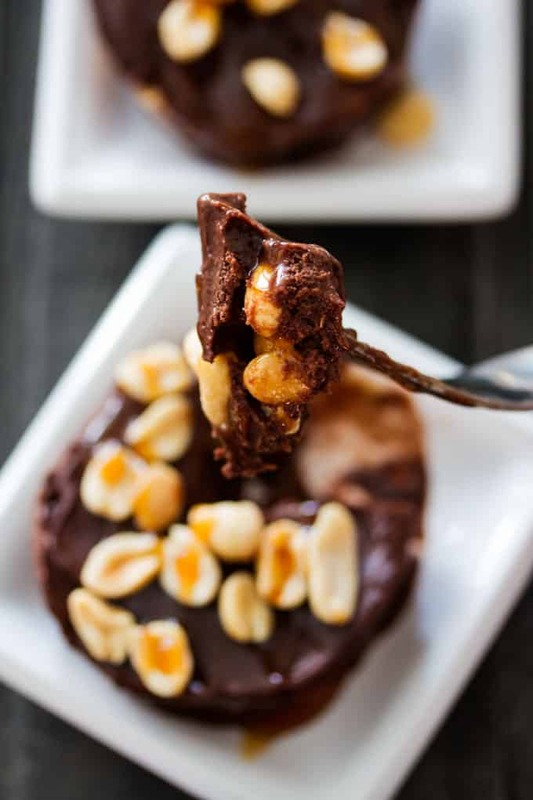 Chocolate Peanut Butter Caramel Ice Cream Cups start with delicious, creamy 4-ingredient nice cream and end topped with caramel sauce and peanuts. Add all nice cream ingredients to blender or food processor. Blend on high until smooth and well mixed. 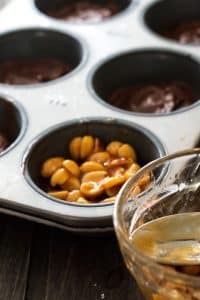 Add a heaping tablespoon to the bottom of each muffin tin cup. Pack it down. Mix peanuts and caramel sauce. 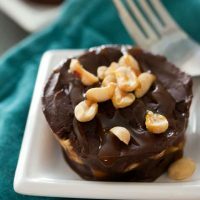 Ingredient amounts are approximate and you may want more or less peanuts and caramel sauce. Add a layer on top of the nice cream mixture in each cup. Add another layer of nice cream to each cup. Place muffin tin in freezer for at least 30 minutes to set. When ready to consume, remove from freezer and gently remove by running a knife around the edge. The ice cream cups should easily pop out. 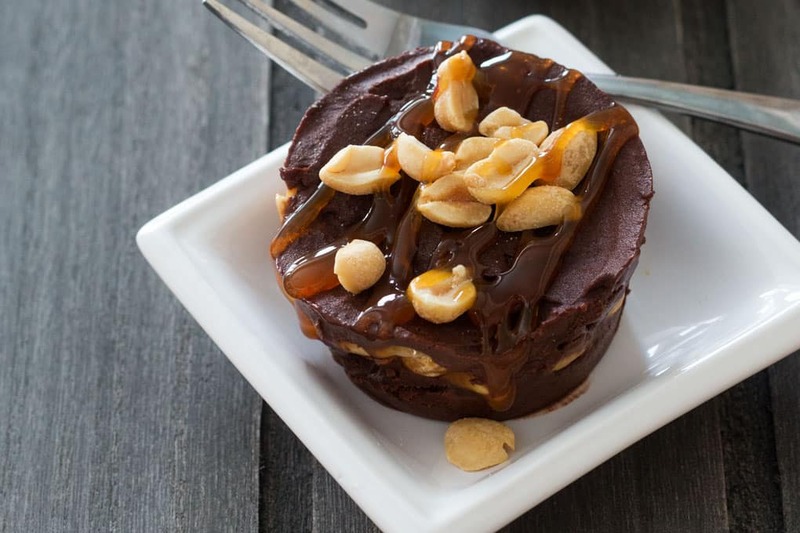 Serve on a plate and serve topped with additional caramel sauce and peanuts. If you like these mini ice cream cups then you'll love our Smores Muffin Tin Ice Cream Cakes.